Notes can be associated with any record in the EQuIS Database. To add a note to a record in EQuIS Professional, first open the table and find the row. Next, click on the Note button to the left of the record. Existing notes for existing objects (denoted by notes icons, shaded in yellow, in the table below) can also be opened. 1.Toggle the Notes key at the top of the list within the Column Chooser. 2.Click the Notes button on the grid toolbar. Notes are automatically hidden if there are no notes in the database (i.e. 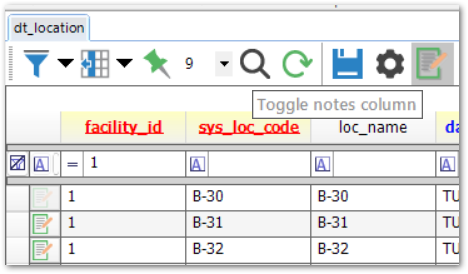 the DT_NOTE table storing the notes, which appears in Data Tables for users with admin privileges, contains no records). The Notes button is disabled on view tables; turning on Notes via the Column Chooser within a view will display notes associated with the EUID listed for that view. Because of this, editing notes from within a view is not recommended. Click a Notes icon and the Notes Form will open in a new window. 1.Previous Notes will be visible in the top-right pane and can be viewed by clicking on that entry. 2.Press the button in the lower-right pane to clear the form, and make a new Note entry. Changes will be lost when this button is pressed. 3.Click the Save button in the lower-right pane to add or resave Notes to the database. 4.Delete Notes by selecting them from the upper-right pane and clicking the Delete button in the lower-right pane. 5.The left pane of the Notes Form displays the record with which the notes are associated. 6.Notes shaded in pink indicate that a due_date was added, and the Note is now overdue. 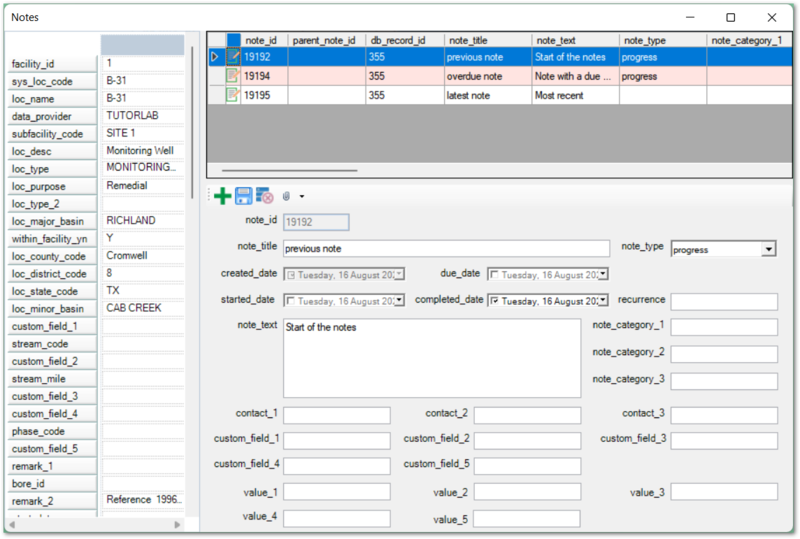 Note: Starting in EQuIS Professional Version 6.6, value fields were added to the Notes Form. After a note has been successfully added, the shading of the Notes icon in the table view will change to indicate that a note is associated with that record. 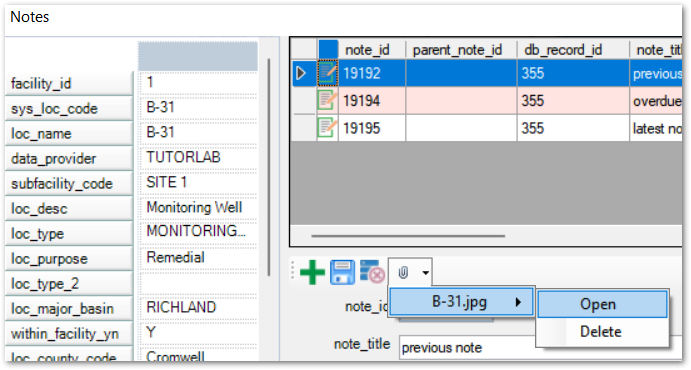 The DQM Module automatically stores information in the DT_NOTE table when a DQM Event is saved. Starting in EQuIS Version 7, a new option has been added to the Notes Form, which allows files to be attached to individual Notes. To attach a file, simply select a Note and click the Attachment button. After a file is selected, it will be uploaded and appear in the drop-down list on the Notes Form. Files already in the database cannot be attached to a Note. Note: Attached files are stored in DT_FILE, and only those file types that have been entered in RT_FILE_TYPE can be uploaded. From the file attachment drop-down list, Notes can be opened or deleted by hovering the mouse over the file and selecting either Open or Delete. Once a file is deleted, it will be removed from DT_FILE and will no longer be associated with the Note. When deleting a Note, it will also delete all of the associated records in DT_FILE.